Another day, another social networking tool. Pinterest is the latest to garner big interest with users, but it’s actually been around for more than a year. Pinterest is the 16th most popular website in the U.S., the 25th most popular in Canada and the 31st most popular in the UK, according to AppAppeal. As one who advises LE agencies to go where the people are, Pinterest is at the point where law enforcement should give it a serious look. Pinterest is a photo-based social sharing site that allows you to “share the things you love” by posting them to boards. The question becomes: What does law enforcement love? The Kansas City Police Department seems to love a lot – at least by evidence of its Pinterest boards! The department has been on Pinterest for only three weeks but already has 19 boards. According to Public Relations Specialist Sarah Boyd of Kansas City (Mo.) Police, some of the PD’s most popular boards include KCPD Fuzzy Friends, which features photos of its K9 and horse patrol members as well as a cat who mouses the horse barn. Another board is focused on Identifying Street Drugs and another is on Women Police Officers. Boyd says she first got the idea from the U.S. Army Social Media Team. She said it gives them a place to feature the PD’s thousands of photos but also shows the depth and breath of the department. She added, “a lot of people think of the officer on the street but there are 2,000 people in our department and they all do something different.” KC Police are also interested in having their content appeal to women. In the U.S., Pinterest users are reported to be 83% female (46% in the UK). How about a wanted persons board, an anti-cyberbullying board, a safe driving board, or even a self-defense board? If you can visualize it, you can pin it to a board, and potentially reach large, new audiences. 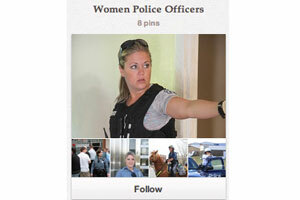 Controversy about Pinterest centers around copyrighted use of photos. So far there haven’t been any major copyright lawsuits involving Pinterest, but some photo sharing sites have created an option for users to opt their photos out from being pinned. Be aware also, according to Pinterest’s Terms of Service, that anything you pin publicly becomes useable to others. This social media QuickTip was originally published on LawOfficer.com on April 11th.